This girl wants to look like the most famous Disney characters and for this we have prepared many hairstyles and clothes with which to get it. In the left part of the screen you will find the interactive buttons and each of them belong to different elements. You can change your eyes, eyebrows, and mouths in the first ones. Then we will go to the hairstyles and sure they will sound a lot since they are those of Snow White, Cinderella, Jasmine, Beautiful and many other Disney princesses. With the dresses it happens the same, but also we have other Disney characters like Aladdin, Robin Hood and many more. It turns the girl into a fairy tale princess. 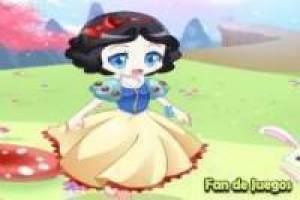 Enjoy the game Little princess, it's free, it's one of our princess dress up games we've selected.